ConocoPhillips Company will provide $1 million to support implementation of the Sage Grouse Initiative (SGI) and benefit sage grouse conservation projects in the West through 2019. 'Conservation of the sage-steppe ecosystem is a critical goal in the Western states,' said Michael Hatfield, vice president, ConocoPhillips Rockies Business Unit. Virgil Moore, Director of Idaho Department of Fish and Game, Noreen Walsh, Mountain-Prairie Regional Director for the U.S. Fish and Wildlife Service (USFWS), and Management Board Members of the Intermountain West Joint Venture (IWJV), today announced that ConocoPhillips Company is providing $1 million to support implementation of the Sage Grouse Initiative (SGI) and benefit sage grouse conservation projects in the West through 2019. "Conservation of the sage-steppe ecosystem is a critical goal in the Western states," said Michael Hatfield, vice president, ConocoPhillips Rockies Business Unit. "ConocoPhillips believes that the IWJV, in collaboration with USFWS and the National Resources Conservation Service (NRCS) effectively accomplish this conservation objective through science-based, voluntary partnerships with states, landowners and NGOs. We are excited to be a part of the partnership of dedicated conservation professionals who are implementing SGI." ConocoPhillips will provide $200,000 a year for the next five years to the IWJV to support implementation of science-based sage grouse habitat conservation through SGI. 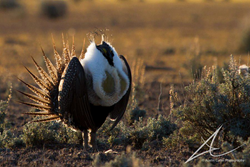 The funds will foster continued science-based, proactive and collaborative habitat work among private landowners, government agencies, and non-governmental organizations to address threats affecting sage grouse. Director Moore, who has joined other IWJV Board Members and staff at the Winter Western Association of Fish and Wildlife Agencies (WAFWA) Meeting, stated, "ConocoPhillips has been a tremendous partner in our sage grouse habitat conservation work through SGI. This proactive investment demonstrates the commitment of the company and our partnership to accelerating sagebrush habitat conservation." Director Moore chairs the WAFWA Sage Grouse Executive Oversight Committee. Established in 2010 by the NRCS, SGI has become one of the largest and most effective proactive sagebrush conservation efforts in history. To date, NRCS and its partners have committed $354 million to sage grouse habitat conservation on over 3.5 million acres through SGI. The IWJV has collaborated with NRCS to build the science, field delivery, and communications capacity for SGI through partnerships, including applied science, decision support tools, partner biologist positions, and outreach. The investment by ConocoPhillips will provide critical non-federal leveraging to strengthen and sustain SGI. "SGI has been successful because our partners have bought into this model of voluntary, proactive conservation and stepped up with significant investments," said Chief Jason Weller of the NRCS. "This growing partnership shows what private landowners, NRCS and partners have accomplished together over the last five years, and it will play a key role in transforming the initiative into a durable conservation effort." 11 state fish and wildlife agencies that have collectively contributed $200 million since 2000 to support sage conservation and are working to develop state conservation plans that address critical threats; Private landowners who have actively engaged in sagebrush conservation and made substantial contributions of financial resources and services to benefit sage grouse; The USFWS, which has made significant commitments to sagebrush habitat conservation through voluntary incentive-based programs and other mechanisms; and An array of other federal and state agencies, nongovernmental conservation organizations, foundations, and corporations. "ConocoPhillips has been a longstanding supporter in the cooperative and voluntary habitat conservation approach of the IWJV," Walsh said. "This generous support of science-based, sage grouse habitat conservation work will help immensely to continue the all-hands-on-deck effort to conserve not only sage grouse, but also other wildlife that rely on sagebrush. With this support from ConocoPhillips, this epic collaboration effort just got even stronger." The IWJV is a self-directed partnership working across all or parts of eleven Western states to conserve habitats in the Intermountain West that are capable of sustaining bird populations at desired levels. The funds are administered for the IWJV by Pheasants Forever, a valued partner in SGI implementation. Pheasants Forever is dedicated to the conservation of pheasants, quail and other wildlife habitat through habitat improvements, public awareness, education and land management policies and programs.